Kailey Halsell, a fifth-grade student in Krystal Craft’s class at Hermosa Elementary School smiles as she displays her certificate Thursday after winning the school’s annual spelling bee. Students in grades 3-5 competed in the event, and 16 rounds were completed before Halsell won on the word “tribulations.” Runner-up was third-grader Jonah Doporto. Halsell will now advance to the regional bee March 1 in El Paso, Texas. 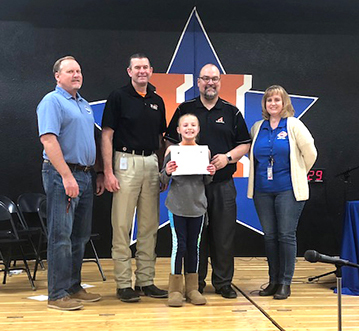 Pictured with her are, from left, Hermosa principal Mike Worley, Artesia Public Schools assistant superintendents John Ross Null and Danny Parker, and judge Melissa Plotner.